IN December of 1982 a young German physician named Alexander Knuth climbed into his car and set off on the three-and-a-half-hour drive from Frankfurt to Brussels. Carefully tucked into his shirt pocket, so that his body heat would keep it warm, was a flat plastic flask known as a cell-culture bottle. The flask contained cancer cells isolated from one of Knuth's patients, a German postal worker we will call Frau H., who at the time was losing ground to a rapidly advancing form of skin cancer and was not expected to live much longer. Several months later Knuth sent to Brussels, in a container packed in dry ice, a small quantity of Frau H.'s white blood cells -- the portion of blood that includes the most potent cells and molecules of the immune system. In those two consignments were the cellular protagonists in one of the deepest, most complex, and often most heartrending dramas in human biology -- the battle between the immune system and cancer. Those particular cells would figure in a marvelous scientific saga that more than a decade later has given a new twist to a very old form of medicine: vaccination against a disease after it has been diagnosed in the patient. Working in a two-person laboratory at the University of Mainz, Knuth had noticed that Frau H.'s white blood cells, and by implication her immune system, seemed to recognize her cancer cells with exquisite specificity. No tools existed at the time, however, to record the full richness of the relationship between white blood cells and cancer cells -- a relationship typified by behaviors we usually ascribe to psychology: recognition, evasion, tolerance, even mortal violence. Knuth didn't know exactly what those immune cells recognized. He did, however, know of a researcher who had painstakingly been developing the technology to help him figure it out. For more than a century doctors have nourished the hope of enlisting the immune system in the battle against cancer -- specifically, of manipulating the immune system so that it will track down and eliminate tumors and the spreading seeds of malignancy, known as metastases, in much the way it tracks down and eliminates viruses and other pathogens. Crucial to this effort has been the belief that tumors display antigens -- distinct molecular landmarks on their cell surfaces -- that betray the malignant nature of the cell within and might therefore incite an immune response. For many years researchers have presumed that tumor antigens useful for a vaccine strategy exist, but these have stubbornly eluded scientific capture. Although a long history of anecdotal evidence has suggested that the immune system has in some rare instances caused certain cancers to disappear on their own (melanoma and kidney cancer among them), attempts to translate that evidence into useful therapies have produced chiefly disappointment. Cancer remains little affected by immunological approaches -- indeed, by most of the current kinds of treatment, with the possible exception of surgery. About 1.4 million Americans are found to have cancer each year, and nearly half these cases prove to be incurable, usually because the disease has spread too far by the time of diagnosis. According to George Canellos, a professor of medicine at Harvard Medical School, about 50 percent of people with cancer survive for five years after diagnosis and are considered cured, but the vast majority of those cures are achieved with surgery. Only about 10 percent of patients are cured by radiation alone, and only five percent by the combination of radiation and chemotherapy. Except in childhood cancers and a few adult malignancies, chemotherapy alone rarely produces a five-year remission. These sobering statistics fall within the shadow of a larger, and unfortunate, public perception that was shaped in part by Richard Nixon's declaration of war on cancer in 1971. The inevitable implication of Nixon's declaration was that cancer, presented for the sake of political convenience as a single enemy, might finally be conquered by a single cure. If any lesson has become clear in the past twenty-six years, it is that cancers arise from a multitude of circumstances, in many kinds of cells, by way of a large number of molecular pathways, and that they respond to many different treatments. Another powerful message is that once a cancer spreads, neither surgery nor radiation, and only occasionally chemotherapy, can turn the tide -- which is why enlisting the help of the immune system remains such an attractive alternative. "I think it's the only chance we really have to control systemic disease," says Ronald Levy, an oncologist and cancer researcher at Stanford University. "Because the real problem in cancer is metastatic disease, micrometastatic disease. It's the reason we don't cure people now." Alexander Knuth's initial journey to Brussels might have been viewed -- indeed, was viewed by some of his German colleagues -- as the latest in a long succession of fool's errands in the field of tumor immunology. Once in Brussels, Knuth passed on Frau H.'s cancer cells to Thierry Boon, a Flemish-born, French-speaking, American-trained medical-school dropout who headed a large laboratory at the Catholic University of Louvain, funded by the Ludwig Institute for Cancer Research. Boon had become fascinated -- almost against his will, to hear him tell it -- with the immunology of cancer, which, after decades of search for those elusive antigens, was in considerable disrepute around the time his interest was piqued. Boon, Knuth, and their colleagues in Brussels and Frankfurt set out to understand the relationship at the molecular level between the immune system and cancer cells -- what the immune system perceives and in what context, how it is able to distinguish a cancer cell from a healthy cell, and how the tumor responds to intense and potentially lethal scrutiny. THE was a dark-haired, somewhat plump woman, thirty-seven years old and the mother of two teenagers, who intensely disliked her job sorting mail during the early-morning shift at the local post office in a small town just southwest of Frankfurt. The tragedy that ultimately led to Frau H.'s exalted status in the world of tumor immunology announced itself in a whisper of minor symptoms: fatigue, vague abdominal distress, cramps, pallor. As her health declined, she spent entire days lying in bed. Finally, after Frau H. consulted her regular physician in March of 1982, doctors at her community hospital suspected she had developed several large cysts, probably cancerous in origin, and sent her to the Department of Gynecology at the nearby University of Mainz for surgery. The "cysts" turned out to be three tumors, one in her ovary and two in her adrenals; the latter two were later estimated by her doctors to be about the size of grapefruits. Cancer cells usually betray the stamp of the tissue where they originated, and Frau H.'s tumors had actually metastasized from another site. Her doctors never located the original, or primary, tumor, but laboratory tests eventually confirmed that all the trouble started in a pigmented cell, or melanocyte, in the skin. Frau H., in fact, had the deadly skin cancer known as melanoma -- a disease that will strike some 40,000 Americans this year, and one whose incidence has increased radically throughout the world in recent years, owing to sunbathing and, perhaps, a thinning ozone layer. Frau H.'s melanoma was especially aggressive. At the time of her second surgery doctors discovered another bad omen: the cancer, which had already spread to an ovary and the adrenals, now had metastasized to a lymph node beneath her right armpit. Frau H.'s surgeons referred their patient to the University of Mainz's new oncology clinic. This was headed by the thirty-four-year-old Knuth, who had returned to Germany the previous year after a three-year research fellowship at Memorial Sloan-Kettering Cancer Center, in New York City. Tall and rail-thin, with a decisive and briskly competent manner, Knuth considered himself a product of the United States despite his Germanic upbringing in Hamburg. He had learned excellent English during that stint in New York and a previous one as a high school foreign-exchange student in Berkeley, California. He had worked on an experimental melanoma vaccine at Sloan-Kettering; fresh in his memory was a patient known as "A.V." who in 1976 experienced a rare and remarkable event. Injection of cells from his own tumor as a vaccine had triggered an immune response that helped A.V. to recover from an extensive metastatic melanoma. He is still alive today. Knuth helped to show that this patient made immune cells that recognized and attacked his melanoma. Even in desperate cases, however, treatment begins with the conventional. "We put [Frau H.] on chemotherapy, first choice," Knuth told me in November of 1994, when I visited him at his office at the Krankenhaus Nordwest, a hospital in Frankfurt, "because we needed to do something that was an established therapy at the time." When the chemotherapy provided no benefit over the course of a year, Knuth moved on to a second strategy. He decided to repeat the crude tumor-vaccine experiment from Sloan-Kettering: he took chunks of Frau H.'s excised tumor, broke them down into component melanoma cells, and started growing these cells in laboratory culture flasks. This cell line (the one he drove to Brussels), christened with the name MZ2, was destined to become one of the most productive in recent cancer research. The tumor is only one partner in the tango of melanoma; the other is the immune system. Knuth turned his attention to the relationship between a subset of immune cells known as cytolytic ("cell-killing") T lymphocytes and Frau H.'s melanoma cells. As in team sports, the immune response has its role players and its stars, and T lymphocytes are stars. T cells retain a memory for the viral and bacterial antigens they find, and they are unusually effective killers. They can even identify cells within which a virus or a cancer lurks. The German researchers peering into their lab dishes saw, to their surprise, that a small number of Frau H.'s cytolytic T lymphocytes not only recognized the melanoma cells from her body but killed them in the test tube. This discovery made Knuth "antsy," he says, to try to reinforce this response with a tumor vaccine. This would require altering, or mutagenizing, her cancer cells. At the suggestion of Lloyd Old, his former mentor in New York, Knuth got in touch with Thierry Boon. After receiving Frau H.'s cancer cells Boon exposed them to powerful chemicals to create mutations. He knew that when mutated tumor cells are injected back into the body, sometimes the unmutated tumor suddenly becomes "visible" to the immune system and succumbs to an attack by T cells. Boon had demonstrated this before, but only in mice, never in human beings. He and Knuth almost didn't get the chance with Frau H. "The chemotherapy was not working," Knuth said. "And since the mass in the lymph node in the armpit was growing so fast, we then asked the surgeons to remove it, because it appeared at the time that that was just a single, isolated, additional site." It was not. Frau H.'s disease had advanced much further than the doctors had suspected: it had spread not only to her adrenals, ovaries, and lymph nodes but also to other organs. In July of 1983 surgeons removed one cancerous kidney and her spleen, but did not manage to cut out all the affected tissue (did not achieve, in Knuth's words, "clean surgical margins"). "It was questionable at that time if she was really free of disease," he said. "We definitely thought she would die. With such a vastly metastatic tumor, it would be very unusual that someone didn't die." After one final course of chemotherapy, Knuth initiated injections of the vaccine in February of 1984. Roughly 100 million cancer cells derived from Frau H.'s own tumor, altered by Boon's chemically induced mutations and then killed by irradiation shortly before each treatment, were injected at intervals of four to six weeks. The dry data of medical records conceals many an unexpected plot twist. In Frau H.'s case the "key situation," according to Knuth, occurred soon after the vaccinations began, when the German doctors detected yet another tumor mass, a three-centimeter growth; it appeared, not surprisingly, in the region of the kidneys and spleen, where surgeons feared they had not succeeded in removing all the cancerous tissue. Monitoring the mass with ultrasound and CT scans, the doctors watched with apprehension as it grew to a diameter of eight centimeters, about the size of a large plum. "I remember it very well," Knuth told me, "because I wanted the surgeon to operate on her in the summertime. It was August, and he wanted to go on vacation, and he couldn't do it before his vacation. She was almost scheduled, and then it didn't work for time reasons. So we continued to give her the vaccination. And during the time that the surgeon was away, that tumor started to shrink. It later disappeared, and the surgery was never performed." That was in September of 1984, and that tumor was the last anyone saw of Frau H.'s cancer; it has never come back. Depending on one's point of view, Frau H. was cured by the surgery and vaccine, or somehow managed to cure herself of a highly malignant and undoubtedly terminal cancer. Passing as if through a revolving door from medical miracle back to quotidian banality, Frau H. walked out of the hospital and back to sorting mail in a provincial post office. I first heard a detailed account of Frau H.'s remarkable remission from Thierry Boon. He recalled how Knuth had injected Frau H. in the spring of 1984, how her condition waxed and waned over the following months, how she began to improve steadily. "Now, that was in the fall of 1984," Boon told me in June of 1994, sitting under a little gazebo atop one of the hills that overlook Cold Spring Harbor Laboratory, on Long Island, which had invited him to visit and to give a symposium talk. "And then, you know, we continued injecting her every three months, and then every six months, and now I think it's more irregularly. But she is alive and tumor-free." He paused, mustering irony. "We'll never know if our injections have anything to do with it." If truth be told, incidents like Frau H.'s miraculous cure (and popular accounts of them) are eyesores on the landscape of medical progress: with the subtlety of billboards they promise much and yet rarely deliver scientific information that will ultimately benefit other patients. Frau H.'s remarkable case history has never been published in the medical literature, primarily because her German doctors failed -- on purpose and after painful deliberation -- to gather one crucial piece of evidence. When that last tumor began to shrink, in the fall of 1984, Knuth wrestled with the kind of dilemma that illustrates how good medical care and good research often work at cross purposes. He knew they could make a convincing case that the vaccine had worked if they performed a biopsy on the shrinking tumor and confirmed that it was indeed a recurrence of the original cancer. He also knew that in snipping away even a small piece of malignant tissue they might endanger Frau H. by accidentally disseminating tumor cells and promoting the spread of what had already proved itself to be a highly malignant cancer. They chose not to tamper with the shrinking tumor. Thus they were left with one very pleasing anecdote and no proof that their improvised vaccine had made a difference. Boon, Knuth, and their colleagues nonetheless achieved one scientific triumph. Using Frau H.'s T cells and cancer cells, they uncovered the first T-cell-specific tumor antigen in human beings -- that is, the first marker recognized by T cells that appears on cancerous but not normal human cells. This discovery, first reported in the journal Science in 1991, and the techniques that made it possible, have opened the gates to a stampede of research into the reinvigorated field of tumor immunology, with the result that physicians have begun to choose patients likely to respond to several highly specific experimental cancer vaccines. It is still early in the story, with no guarantees of success, but there are preliminary hints that the vaccines may be useful in the treatment of melanoma and perhaps other, commoner malignancies. I MUST tell you," Thierry Boon said when I visited him several years ago in his Brussels laboratory, "I'm by training a molecular geneticist. I'm not an M.D. I'm not an immunologist. And I was certainly not a tumor immunologist to start with. I stumbled into this whole thing." "Stumbled" seems far too blundering to describe anything Boon (pronounced "Bone") might do. Tall, thin, elegantly dressed, and charmingly outspoken, Boon has a close-cropped graying beard, dark eyebrows, and a long and slightly hooked nose. He wears his two predominant attitudes, modesty and arrogance, like a reversible coat. "I really grew up on this principle of molecular biologists -- you know, we are intelligent, and the less we know of what other people are doing the better," he told me, confessing in almost the same breath an unfamiliarity with the literature in tumor immunology and adding with an apologetic shake of the head, "I am particularly illiterate." He is also something of a scientific loner -- one of those increasingly rare researchers, manifestly intelligent and sufficiently self-confident, who can thrive outside the scientific mainstream. Born in 1944, Boon grew up in the great university town of Louvain, about ten miles northeast of Brussels. In the sixteenth century Mercator and Vesalius walked the city's narrow, curving streets, one reconfiguring the cartography of the planet and the other the cartography of the body. Boon's mother came from a French-speaking background, and his father, who for many years was the chief executive at a Belgian brewery, from a Flemish one. "I did my secondary studies in Flemish," Boon told me, "because by the time I got to secondary school, it was already forbidden to have a French-speaking secondary school. You know, we have our tribal problems here. Fifty years ago, if you wanted to climb in society, you had to learn French." His father would have preferred that he pursue a career in business -- "money and all that" -- but he chose research instead. When he decided to study biology at the Catholic University of Louvain, he received a shrewd bit of counsel from a friend of his father's: study medicine, because the faculty was better. The source of the advice was Christian de Duve, a biochemist who in 1974 won a Nobel Prize for work on the internal organization of the cell. Boon studied medicine for three years, just long enough to get turned off by the prospect of clinical practice and to get excited about the kind of research he was doing in De Duve's laboratory. He decided to quit medical school and pursue basic research. In 1965, at the age of twenty, Boon landed a position as a graduate student at Rockefeller University, in New York. After spending two years in his room studying mathematics and physics, he arrived in the laboratory of one of the central figures in the early history of molecular biology, Norton Zinder. "Before he worked for me," Zinder recalled recently, "he went and read all my reprints and told me which ones were wrong." Boon spent six years at Rockefeller, and was by his own appraisal not a very good colleague, "not particularly friendly or helpful, because I wanted to work all the time." His research was narrowly focused on viruses that prey upon bacteria. But the philosophy of the research -- reductionist, rigorous, supremely confident in the power of genetics -- gave him an approach that would prove essential in solving longstanding puzzles in tumor immunology. Boon, like Knuth, considers himself "a child of the States intellectually," but more than that he brought a powerful reductionist approach to a scientific problem that had stymied others for decades: "If I had now to drop every semblance of modesty and say why we were successful in doing what we did, it was really two points. First, as has been done in almost every area of modern biology, we introduced genetics into tumor immunology. And second, by illiteracy and also by psychology I would say, I've never listened to or trusted one bit of what the tumor immunologists were saying. We believed only what we saw ourselves." Zinder calls Boon's approach to science "infinitely, scrupulously detailed and analytic." When Jacques Monod, the brilliant French molecular biologist, gave a seminar at Rockefeller in the early 1970s, he visited Zinder's lab and heard about Boon's work. He invited Boon, who was finishing his Ph.D., to join the staff of the Pasteur Institute, in Paris. But Monod became the director of the institute in 1971 and had little time for laboratory inquiry, so Boon transferred to the lab of François Jacob. Jacob, who had shared a Nobel with Monod for their hypothesis about how genes are turned on and off in normal cell physiology, was focusing on the genetic and molecular processes that orchestrate the orderly development of a single fertilized cell into the more specialized cells and tissues of a mature organism. Against Jacob's advice -- yet another example, Boon admits, of "getting advice from first-rate people and never following it" -- he decided to study this process in mice. "And there was a tumor," Boon remembers, "a very strange type of tumor ..."
"I Thought I Would Faint"
TERATOCARCINOMA is a cancer that derives its name from the Greek word terat, meaning "monster." It is a grotesque aberration of normal embryological development. Tumors can arise during the earliest stages of embryological development in many animals, including human beings, and usually result in spontaneous abortion. The genetic wiring has short-circuited in the midst of the process that forms different, specialized tissues; as a result, the tumor gets diverted to a particular genetic pathway and in essence repeats the same anatomical phrase over and over again. Hence these tumors have been known to generate the most peculiar special effects: teeth, hair, bone, muscle, cartilage, almost any kind of tissue. For many years researchers tinkered with these tumors and then transplanted them into mice as a way of studying the process of normal embryological development. Boon and a colleague, Odile Kellermann, hoped to tease out details about the genetic blueprint that governs the embryological development of specialized tissues by creating mutations in the tumors and seeing what happened. Their first experiments produced a surprise. Beginning in 1972 they exposed teratocarcinoma cells to a very strong chemical agent that caused mutations, and then injected the mutated cancer cells into mice to see if there was a genetic pattern to the weird variations that grew out of the tumor; as a control they injected other mice with unmutated teratocarcinoma cells. The control animals almost always developed rampaging cancers, but in roughly 30 percent of the experimental animals the mutated cancer cells never took hold. As a geneticist, Boon realized he had fiddled with the genes of the tumor cells in an interesting and possibly important way. Quite by accident he had created a mutation in cancer cells that genetically changed them so that they were no longer viable as cancers. At that point Boon knew nothing about cancer, but he felt impelled to understand why the mutated tumor cells no longer formed tumors. The short answer, Boon's group learned, was that the researchers had not altered the tumor's malignant traits but had instead marked the cancer cells with a badge of mutation, so that the cells were suddenly distinguishable to the mouse immune system -- somewhat like an alien organ that might be rejected following transplant surgery. Boon and Kellermann had created, it turned out, man-made tumor antigens. To pull the plug genetically on a malignancy and prevent it from even appearing was pretty unusual, even in inbred mice. Boon knew at least that much, although not much more. Sometimes, however, ignorance can be a scientist's greatest ally. What Boon learned afterward was that the field of tumor immunology was "an absolute morass." He had committed himself to what he calls the "untouchables of immunology." That might overstate the disrepute in which tumor immunology was held in the 1970s. But it would be fair to say that it was a field associated with a lot of noise and but little practical progress. Georges Mathé, a flamboyant French hematologist, had stunned the medical community in 1969 by claiming that children with leukemia could experience a prolonged remission with injections of bacillus Calmette-Guérin, an attenuated live bacterium. There is no doubt that BCG stimulates the immune system; it has by now been used in more than two billion people worldwide as a vaccine against tuberculosis. Mathé's claims touched off a frenzy of clinical trials of BCG against a variety of cancers, with almost total failure. Other researchers tried injections of blood serums and pig lymphocytes, and other experimental therapies, without success. The most devastating blow came from England. Working at Mount Vernon Hospital, outside London, Harold B. Hewitt published a paper in 1976 summarizing an extraordinarily exhaustive series of experiments undertaken over a period of nearly two decades which appeared to undermine the very idea that tumors could incite an immune response. Most of the animal tumors that researchers studied were induced either by viruses or by high doses of chemical carcinogens (painting animals with methylcholanthrene, or coal tar, was a common technique); animals with "experimental cancers" were then created by transplanting these tumor cells into related inbred animals. In many cases researchers could show that these "man-made" tumors were detectable by the immune system, and that animals "vaccinated" with these tumor cells did not develop cancer. Hewitt argued that such tumors were merely "seductive" artifacts; that the cancers that develop in human beings only rarely result from viruses or heavy chemical exposure of the sort that laboratory mice routinely suffer. Much more often they arise spontaneously, owing -- it is increasingly clear -- to a succession of disruptive genetic mistakes. Hewitt and his colleagues identified and studied twenty-seven kinds of spontaneously occurring tumors through some 20,000 transplants in mice, and claimed that not a single one of these "natural" tumors was blunted by an immune-system attack. Tumor immunology had always been built of shaky materials; Hewitt's tendentiously authoritative paper leveled it like a tornado in a tent city. But this was also a fresh wind. Stopping just short of accusing the field of intellectual dishonesty, Hewitt demanded greater rigor in a discipline that had become infatuated with unverifiable results. Boon remained "illiterate," as he puts it, with respect to Hewitt's indictment. In November of 1975, just as Hewitt's paper was being accepted for publication in the British Journal of Cancer, Boon performed what he now considers to be the pivotal experiment of his career. Still working with teratocarcinoma, he once again stumbled onto a remarkable aspect of the immune response to cancer. As before, he injected mice with mutated cancer cells; as before, many of the mice failed to develop cancers. Then Boon took the experiment one step further. He injected the same mice, as well as control mice, with unmutated cancer-causing cells -- the ones that invariably produced tumors. The animals were caged in a corner of a garage at the Pasteur. "I still see myself on a Saturday afternoon," Boon told me, his voice full of wonder surprising in someone who prides himself on scientific rigor, "alone in the animal house at the Pasteur Institute in Paris. I thought I would faint -- because all the control animals had the tumor, and more than three quarters of the experimental animals had rejected the tumor. There was no tumor at all!" Once the mouse immune system had recognized and rejected a mutated version of the cancer cells, it gained the ability to "see" the previously invisible unmutated parent tumor. In mice, at least, the immune system was able to detect things that had previously escaped its notice. After moving his laboratory to Brussels, Boon and his chief collaborator, Aline Van Pel, tried to explain this puzzling result in a way consistent with genetic techniques. They set out to find the gene for the antigen that made mutated tumors detectable by the immune systems of mice. This research, which stretched over the better part of a decade, was not for the faint of heart (nor, some American scientists point out ruefully, for researchers who need to show progress every three years in order to get their National Institutes of Health grants renewed). Boon realized that mutations in the mutated tumor cells created tiny differences in the antigens, and that T lymphocytes recognized these tiny changes. The scientific challenge, therefore, came in two parts: to isolate and amplify (clone) populations of mouse T cells that recognized specific antigens, and to use those cells as a kind of molecular magnet to pick out the needle in a genetic haystack -- the gene responsible for the antigen. There was no easy way. From the moment Boon stood breathless in the animal room of the Pasteur Institute to the time his group finally got the techniques to yield an answer in mouse tumors, fourteen years passed. But the researchers had good reason to persevere. In 1983 Aline Van Pel repeated Harold Hewitt's experiments with several spontaneous tumors, and after her mice were "vaccinated" with mutated versions of Hewitt's invariably aggressive cancers, they, too, acquired the ability to reject the unmutated "natural" cancers. The researchers had the opportunity to see whether the same phenomenon would occur in human beings: at about this time the cells of Frau H. arrived in Brussels. DIKE all tumor immunologists, Boon was working at a boundary as much philosophical as scientific: Where does self end and nonself begin? In practical terms the distinction is crucial to survival. The immune system is designed to root out pathogens such as viruses and bacteria with a ferocity that makes it every bit as powerful a force of nature as a hurricane or a volcano. Indeed, the phenomenal rapacity with which T lymphocytes can ravage a transplanted kidney or liver or heart -- large organs weighing several pounds -- has always tantalized immunologists with the possibility of unleashing the same violence upon tumors. But cancer cells teeter on the edge between self and nonself. Cancer begins as a single aberrant event in an otherwise normal cell. The cancer cell eventually breaches every convention of cellular etiquette: in its relentless cycles of replication it sabotages internal checkpoints that normally arrest aberrant behavior, and as the tumor grows, crowding neighboring cells, it evolves, apparently reactivating genes used in fetal development. Rather than seeing a threatening stranger, as it does when it encounters a flu virus, the immune system sees only a wayward uncle -- a bit odd, perhaps, but a relative nonetheless. Even if tumor antigens exist, they don't normally arouse much of a response. The immune system is said to be "tolerant" of the slight differences shown by cancer cells. Immunologists therefore speak of "breaking tolerance" -- of overriding this forgiving relationship and nudging the immune system into recognizing cancer as the threat it is. Boon's group asked, What did Frau H.'s immune cells perceive, and how were they able to arrest her cancer? Here Boon's work began to intersect with one of the most remarkable recent discoveries in immunology. In the 1970s Rolf Zinkernagel and Peter Doherty reported that T cells recognize antigens only in a very special biological context -- when antigens are "presented" in conjunction with a molecule known by the shorthand MHC, for "major histo-compatibility complex." Zinkernagel and Doherty showed, in work for which they received a Nobel Prize last October, that MHC molecules cradle antigens in such a way as to provide what they call the "necessary intimacy of contact" with T cells. About a decade later Alain Townsend, an immunologist at John Radcliffe Hospital, in Oxford, England, and his colleagues demonstrated that a related mechanism occurs in all the normal cells of the body. Each cell in effect cannibalizes every type of protein made inside it and allows the immune system to sample bits of the protein to make sure it is self and not nonself. The agents of this complex enterprise of surveillance are, once again, the lymphocytes -- specifically, cytolytic T lymphocytes. T cells have the ability to search out infinitesimally tiny markers on cells. There are millions of different T lymphocytes, each biologically programmed to recognize a different antigen, and each capable of explosive replication -- on the order of tens of millions of cells in a week or two -- if it bumps into the antigen it recognizes. Beginning in the earliest weeks of life our T cells are programmed in the thymus to recognize only nonself proteins; T cells that recognize self proteins are ablated, or destroyed, lest they attack our own tissues. (Breakdowns in this system do occur: T cells attack the self in auto-immune diseases such as lupus and some forms of diabetes.) Moreover, they are cells with a memory. Once a T cell has detected an antigen, it remembers the encounter and reacts more quickly the next time. Every waking or sleeping moment of our lives, during the homeostatic purr in each of the tens of trillions of cells in our bodies, a molecular salvage crew within each cell tears apart every kind of protein into subunits known as peptides, loads the peptides into the grooves of the MHC molecules, and ships the molecules like industrial barges to the surface of the cell. There the MHC molecules in effect display their cargo in just such a way that the T cells can examine the snippets of protein. To appreciate the precision of this process, consider that each link in a peptide chain is composed of one of twenty possible amino acids. An antigen -- a chain nine amino acids long -- can theoretically be made of 920 possible combinations. T cells can discriminate between self and nonself on the basis of a change in a single amino acid in a peptide. If the proteins are normal, T cells will ignore them. If a flu virus has infected the cell, however, some of its viral protein will inevitably be chopped up and shipped to the cell surface along with normal peptides, and T cells will instantly recognize it as foreign. Indeed, the term "recognition" in an immune-system context is laden with alarm and violence. The T cells destroy the marked cell by perforating its cell wall with tiny pores. At the same time, other T cells blare a chemical alarm: they gush molecules called cytokines, some of which recruit other immune cells to the site and others of which cause the subset of T cells that recognize the foreign marker to multiply. There are drawbacks to this elaborate and robust security system. First, cytokine molecules, such as interferon and interleukin-2, pack an incredible punch, even in vanishingly small amounts. Indeed, the symptoms we usually associate with the flu, including fever, achiness, and malaise, are due not to the influenza virus per se but to the activity of cytokine molecules secreted by aroused immune cells -- the unpleasant side effects of a busy and effective immune system. Second, from the moment an infectious agent is identified by the immune system, it takes about seven to ten days for the T-cell response to reach its peak. Frau H.'s dramatic recovery suggested to Boon that her miracle lay in her molecules; her cancer cells had invited annihilation because they possessed some telltale molecular marker that aroused a response from the very T cells Knuth and Boon had identified in her blood. As is often the case in biology, Boon's laboratory lacked the technology to look directly for the antigen. There existed neither a microscope that could provide a glimpse nor a technology for in effect taking cuttings from a cancer cell's surface and identifying a single protein as uniquely antigenic. (Such a technology has recently been developed by Donald Hunt and his colleagues at the University of Virginia.) So the team looked simultaneously in mice and human beings for genes that contained the instructions for making cancer-specific antigens. And they did have one extraordinarily powerful tool, one more precise than an electron microscope, with which to feel out the three-dimensional shape of the human antigen: Frau H.'s blood. By 1987 the researchers had particularly stable clones of her T cells. They would test every gene in Frau H.'s cancer cells until they found the one that made the marker recognized by her T cells. Only fellow geneticists can appreciate the dimensions of this task and the cleverness with which Boon, Knuth, and their colleagues undertook their search. They knew that such an approach could theoretically work, because in 1989, working with a mouse tumor different from teratocarcinoma, Boon's group identified a tumor-specific antigen that they called P1A in mice. Using the same basic technology, they tackled Frau H.'s DNA. Each human cell, cancer cells included, contains up to 100,000 genes. Each gene contains instructions, encoded in DNA, for a different protein, each of which is a three-dimensional chain composed of dozens or hundreds of amino acids. The large gene for, say, dystrophin, the muscle-tissue protein that is linked to muscular dystrophy, contains about two million base pairs, or letters, of DNA. The hormone insulin has fewer than 2,000 letters, which are the code for a protein fifty-one amino acids long. Because T cells can see only what fits onto an MHC molecule, the immune system recognizes much smaller units -- selected outcroppings of these larger globular proteins, typically measuring about nine amino acids in length. A human antigen would represent a twenty-seven-letter portion of a gene up to two million DNA letters long. Searching for this antigen is like looking for a five-word sentence in a 300,000-word novel, buried in a three-billion-letter text of uniformly fine print. Buoyed by its success in finding a tumor antigen in mice, the Brussels lab chopped up the entire DNA of Frau H.'s melanoma cells -- all 100,000 or so genes, all three billion base pairs -- and parceled bits of the DNA into approximately 700,000 "cosmids," which to continue the metaphor of letters and text might be thought of as man-made slipcases for smaller volumes in the total DNA library. Each of the 700,000 slipcases, containing a slender volume of Frau H.'s genetic text, could then be inserted into a special recipient cell. Each of these recipient cells, from a distinct cell colony, would read the instructions, make the corresponding bit of protein, and ship it to the cell surface. Thus each colony could be scanned by Frau H.'s own T cells to see if it contained the volume -- the gene for the antigen. That was the beastly part of the Brussels experiment. Pierre van der Bruggen, of Boon's laboratory, who did the brunt of this work, used Frau H.'s cancer-specific T cells to identify a mere five colonies of cells, out of 29,000, that contained the gene encoding the antigen. In another series of experiments her T cells pinpointed two more positives out of 13,000 colonies. Early in 1991, about eight years after Knuth's first visit to Boon, Frau H.'s T cells homed in on the prize. They were able to distinguish a tiny molecular bump on the surface of cells in a colony -- a peptide bump, arching out from the surface of the cell and measuring exactly nine amino acids long. Using standard recombinant-DNA techniques, the Belgian scientists cracked open this cell, identified the gene, and produced its complete sequence. Boon called this gene MAGE (for "melanoma antigen"), and the group published the results in Science at the end of 1991. "Human tumor immunology up to that point represented a very empiric, observational, nonmolecular kind of discipline that was held in incredibly low esteem by the scientific community, and rightly so," Drew Pardoll, an immunologist at Johns Hopkins University School of Medicine, told me recently. "All of a sudden, here was a hard-core molecular approach that represented a legitimization of human cancer immunology. There were genes and antigens that had obvious and clear-cut implications for therapy, and could be crafted into antigen-specific vaccines." As Knuth says, "The December Science paper was the turning point, because then human tumor immunology was reborn." DESPITE the almost weekly front-page dispatches about newly discovered genes, whether they are related to obesity or breast cancer, it cannot be stressed enough that the discovery of a new gene does not so much end a story as punctuate a very long preface to what is usually an even longer and more complicated biological tale. Researchers need to understand what protein the gene makes, when it makes it, how that protein fits into cell commerce, and whether the protein plays a central, irreplaceable role or is part of a redundant biochemical chain of events. What MAGE has to do with cancer -- and, more important, with cancer treatment -- still belongs to that larger, more uncertain, unfolding story. The Brussels group discovered that MAGE was one small part of the X chromosome -- a normal but silent gene in normal cells. In about 30 percent of melanomas, however, the gene became active, or was "expressed"; it also appeared to be active, albeit less frequently, in several commoner tumors, including breast cancer and lung cancer. Boon soon had reason to append the numeral 1 to "MAGE," because it quickly became clear that the gene had many siblings -- that it belonged, in fact, to a large family of related genes, all previously unknown to biologists and all inactive in normal, mature cells (with one exception: they are expressed, although so far they are not thought to be a precursor to tumors, in the testes). In 1994 Boon's group reported that the related gene MAGE-3 was present on the surface of a great number of tumors. At last count Boon's group had identified three genes in the MAGE family and two other genes, BAGE and GAGE, that encode tumor antigens. Every one of these genes came to light in Frau H.'s cancer cells before being found in other people's normal cells, and all were ferreted out using Frau H.'s T cells. 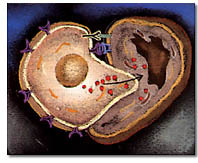 As to why a tumor would avail itself of a normally silent gene, Boon speculates that once a cell is "transformed," or becomes cancerous by whatever means (genetic predisposition, for example, or exposure to chemical carcinogens), it reaches into its own genetic archive and resurrects dormant genes that served the body during its earliest embryological moments -- genes that allow it to move around, or metastasize. "Clearly, genes have not been created to be expressed in tumors," Boon explained. "I believe that all types of genes, like MAGE and BAGE and GAGE, must be expressed in the embryo somewhere or maybe in some cells of the placenta. And the function that these genes have in the embryo -- say, perhaps, for allowing tissues to move or cells to move within tissues -- might be reused by tumor cells when they want to metastasize." Publication of the discovery of the MAGE gene broke the longstanding theoretical logjam in tumor immunology, and, perhaps not coincidentally, the field has rapidly progressed. A growing number of tumor-associated antigens have been identified. Boon's group, and others, have determined that sometimes more than one antigen is associated with a gene: peptides in the MAGE-3 gene associate with at least two different MHC molecules, A-1 and A-2. The Brussels group has also identified two so-called differentiation antigens, which have complicated the picture considerably. These antigens are not specific to melanoma cells per se but are typically expressed in (and restricted to) melanocytes, the normal skin cells in which the cancer arises. It was a surprise that the T cells of some melanoma patients recognized antigens in normal proteins -- a situation that verges on an auto-immune response; Boon's group has found two of these antigens in melanoma, Melan-A and tyrosinase. A group at the National Cancer Institute, headed by Steven A. Rosenberg, has also reported two differentiation antigens, MART-1(identical to Melan-A) and gp100; a team at the University of Virginia independently identified gp100. Several other antigens are also under study, including an unusual form of a protein seen in some breast, colon, and stomach cancers, known as mucin, and a well-known protein called CEA (for "carcinoembryonic antigen"), also seen in breast, colon, and lung cancers. Rosenberg's group recently described another half dozen antigens. Boon says, "I think it's still a perfect possibility that there will be hundreds of them." The discovery of T-cell-specific antigens has "inaugurated a new era in cancer immunology," according to Lloyd Old, who heads the Ludwig Institute and is an elder statesman in the field. If they did not exactly scream "nonself," these antigens at least whispered "not quite self," and did so loudly enough to attract notice from the immune system. In light of this and subsequent discoveries, Alan Houghton, a cancer immunologist at Sloan-Kettering, has come to refer to cancer cells as "altered self," rather than "nonself." By identifying tumor-antigen genes, Boon and many other cancer immunologists throughout the world could begin to test ideas about manipulating the immune system to react more aggressively to these signals from the altered self. Not surprisingly, considerable hurdles remain. IF tumors wave red flags at the immune system, why don't T cells charge like aroused bulls? The answer is that during the development of a malignant disease, tumor cells must evolve in order to survive, and one crucial adaptation is to become invisible to the immune system. Joost Oppenheim, a researcher at the National Cancer Institute, has observed that viruses know a lot more about the human immune system than immunologists do, and the same could be said of tumors. Far from being the mindlessly replicating drones of popular description, tumors are exceedingly clever about thwarting the immune system. Lloyd Old has referred to this ability as the "Houdini phenomenon." If cells of the immune system recognize and react against a tumor antigen, a tumor cell may mutate to shut off the gene encoding that antigen, muffling the cry that gives away its identity as a cancer cell. This kind of cell will have a survival advantage as the disease evolves. And tumors have other tricks to jam the chemical signaling of the immune system. They can "upregulate,"or churn out, genes that make molecules that signal the immune system to throttle back; and they can "downregulate," or reduce the production of, genes that make molecules that carry signals between immune cells. In extreme cases the tumor may shut down any of several genes that tell the cell how to make and use the crucial MHC molecules, thus short-circuiting the body's security system altogether. These various evasive strategies go by the name "tumor escape mechanisms." Walter Bodmer, the director of the Imperial Cancer Research Fund, in London, reminds colleagues to "think evolution, evolution, evolution" when pondering the mutations common to cancer cells. Playing by the same Darwinian rules of survival as penicillin-resistant bacteria, tumors constantly evolve so that the heartiest, most evasive, and, alas, most malignant tumor cells survive. "There is constant competition among the tumor cells," Boon explains, "for the one that is going to be a little more malignant than the others, multiply a bit better, invade [surrounding tissues] a bit better." In the context of such evasive behavior Boon has used the MAGE gene to show just how individual a disease cancer is. Once the cancer begins to grow, it does so in an immune-system ecology that is unique, because of genetics and "personal immunology": as Boon discovered with the MAGE genes, one reason that many melanomas remain invisible to the immune system is related as much to the patient's genes as to the characteristics of the tumor. Again, cytolytic T cells are incapable of detecting an antigen -- be it a snippet of flu virus or a scrap of MAGE-1 -- unless it is presented on the surface of the cell by MHC molecules. But there is enormous genetic variation in the human MHC system, much more so than in hair or eye color. Each of us inherits six subtypes of MHC transport molecules, also known as HLA markers, such as HLA A-1, A-2, B-24, B-37, C-4, and C-6, from among hundreds of possible subtypes. These subtypes serve as very specific blood markers, similar to but much more precise than blood type. Only certain peptide antigens will fit each of the HLA subtypes. Thus for an immune system to have a chance at destroying a melanoma (or perhaps one of many other cancers) it is not enough to have a tumor displaying the MAGE-1 antigen; the person must have inherited the proper HLA molecule, with the right-sized molecular groove into which the relevant peptide from MAGE-1 will fit. If the antigen doesn't fit, the immune system will never see it. Boon's work with Frau H.'s blood demonstrated that MAGE-1 fits snugly into only HLA A-1. Approximately 26 percent of Caucasians, including Frau H., carry the A-1 molecule. In practical terms, whether or not a melanoma is immunogenic depends on heredity. If 30 percent of melanoma patients produce MAGE-1 antigens and 26 percent of Caucasians carry the HLA A-1 protein, a simple calculation demonstrates that only about eight percent of Caucasians with melanoma will have the right combination of tumor antigen and MHC molecules to allow the immune system to detect the tumor. That number sounds low. But each additional antigen discovered improves the odds; this has been especially true since the Brussels laboratory reported the discovery of MAGE-3. This antigen, presented by A-1 and A-2 molecules, appears in 70 percent of metastatic melanomas and also in many lung tumors, bladder tumors, and head-and-neck squamous-cell carcinomas. This means, Boon later wrote, that "for the first time we can select as candidates for therapy those patients who have a chance of benefiting from immunization." THE notion of vaccinating people against their cancer after the cancer has been discovered has been in and out of fashion since the turn of the century: a primitive cancer vaccine was developed in 1893 by William B. Coley, of Memorial Hospital in New York. A number of first-generation melanoma vaccines have been tested since the early 1970s, some of them in studies conducted by Michael Mastrangelo and David Berd, at Jefferson Medical College, in Philadelphia; Malcolm Mitchell, now at the University of California at San Diego; Donald Morton, at the John Wayne Cancer Institute, in Santa Monica; and Jean-Claude Bystryn, at New York University Medical Center. Most of these vaccines have been created by grinding up or irradiating tumor cells and injecting them into patients, somewhat as Boon and Knuth did with Frau H. But the experimenters have typically lacked precise molecular knowledge about what antigens the vaccine contained, what sort of immune response it might inspire, and who might be genetically disposed to respond to it. Although many physicians think that randomized clinical trials of these vaccines have not provided clear-cut demonstrations of efficacy, there has been consistent evidence from nonrandomized trials that at least 10 to 20 percent of patients have favorable responses; indeed, it is likely that Frau H. responded to just such a crude, almost desperate intervention. What separates the MAGE work from previous vaccine strategies is that Boon and Knuth successfully tackled the very substantial problem of explaining on the molecular level how and why an immune response occurred. Using a simple blood test and an analysis of the tumor, a physician might now be able to predict which patients are likely to respond to vaccination and design a vaccine to induce the desired response. On the basis of Boon's work, laboratories in Europe and the United States are performing those tests, and patients are receiving experimental tumor vaccines. Each antigen provides the starting point for a different cancer vaccine. Doctors have begun to test a dizzyingly broad array of potential vaccines in patients, and although these initial trials are designed to test the safety rather than the effectiveness of the vaccines, researchers have reason to be optimistic. In 1993 Boon's group, in conjunction with Alex Knuth in Germany and doctors in Italy, France, Belgium, and the Netherlands, prepared a bare-bones vaccine using a small immunogenic fragment -- the MAGE-3 peptide -- to see if it would provoke a measurable rise in T cells in genetically compatible patients. "I would bet everything that we are not going to see any effects," Boon predicted at the time. "But who knows?" More than a year later the results were surprising. In December of 1995 Boon, Knuth, and their colleagues published a report on their MAGE-3 vaccine in sixteen patients selected for compatible HLA types. Because the patients had rapidly advancing cancers, only six of the sixteen received the complete course of treatment, which consisted of injections of the MAGE-3 peptide once a month for three months. Nonetheless, three of six patients with advanced disease experienced "very significant" tumor regressions, and the side effects reported were negligible. After three injections a Belgian woman with about a hundred small melanoma nodules on her left leg began to experience a remission. Four months later all the tumors had disappeared. A Dutch woman whose melanoma had spread to her lungs also enjoyed a complete remission, with four of her lung tumors disappearing about three months after her third injection, and the fifth shrinking. Updating these still very preliminary results at a meeting in the fall of last year, Boon reported that five of sixteen melanoma patients who underwent the entire course of treatment experienced significant responses. Once researchers identify an antigen, they may present it to the immune system using a variety of vaccine strategies. Steven Rosenberg, at the National Cancer Institute, has nine different vaccine trials under way, and has treated about 141 patients. He has inserted genes encoding tumor antigens into several common viruses, including adenovirus and vaccinia virus, and given them as vaccines, with or without a follow-up dose of the cytokine interleukin-2; he has also genetically modified some of these peptides in an attempt to elicit a stronger T-cell response. His group has seen several responses that he describes as "sporadic, and I emphasize sporadic." A group at the University of Virginia, headed by Craig Slingluff and Victor Engelhard, recently began testing a melanoma vaccine based on portions of the gp100 antigen; the vaccine is being administered with one of two adjuvants, which are concoctions of oil, water, and various other ingredients that seem to stimulate a generalized immune response. There are still other variations on this theme being actively pursued. Ronald Levy and his colleagues at Stanford University are testing a vaccine against non-Hodgkin's lymphoma. In this case they isolate the antigen specific to each patient and insert it into immune cells known as dendritic cells, which arouse particularly vigorous T-cell reactions. They then vaccinate patients with these altered cells. So far they have seen encouraging responses in a small number of patients. A group headed by Walter Storkus and colleagues at the University of Pittsburgh recently began a trial with a similar dendritic-cell vaccine against melanoma. Meanwhile, a group headed by Drew Pardoll, at Johns Hopkins, has begun giving patients with advanced kidney cancer a vaccine developed using a technology called gene therapy, in which a desirable gene is inserted into a person's cells. In this approach researchers insert the gene for a cytokine, or signaling molecule, known as GM-CSF (for "granulocyte macrophage colony stimulating factor") into irradiated tumor cells and inject these cells back into patients, so that the disabled cancer cells will send a message recruiting helper T cells to the tumor. Pardoll says the group has already seen "some evidence of clinical response." Using a similar gene-therapy approach with a different cytokine molecule, interleukin-12, Michael Lotze and Hideaki Tahara, of the University of Pittsburgh, have seen five "interesting" responses out of twenty-six patients in early trials. One of the most unusual and unorthodox approaches has been championed by Pramod Srivastava, of Fordham University, in New York. Srivastava's group has identified a class of molecules inside cells collectively known as heat-shock proteins, which collect peptides. Srivastava maintains that by isolating heat-shock proteins from a tumor cell, he can capture the entire antigenic repertoire of any patient's tumor at one time and then administer this repertoire of antigens as a vaccine. A pilot clinical trial has been completed in Germany, and a new trial is scheduled to begin this spring in the United States. Finally, recent clinical work by Alex Knuth in Frankfurt serves as a reminder that excitement over these new vaccines must be tempered with caution. In preliminary safety studies Knuth's group has injected GM-CSF directly into melanoma patients and then vaccinated them with peptides from several differentiation antigens. To date the group has seen four beneficial responses in sixteen patients with metastatic melanoma, but it has also seen evidence of the "Houdini phenomenon" in several patients: apparently, in the presence of T cells some tumors stop expressing the antigen targeted by the vaccine. Because of this broad array of approaches, Lloyd Old, of the Ludwig Institute, remarked that there is "a healthy lack of unanimity on the proper way to proceed." All these vaccines await the kind of randomized clinical trials necessary to establish their efficacy. However, Victor Engelhard says, "We've got five or six different proteins in the case of melanoma, at least one good one in the case of ovarian cancer, and one very unusual antigen in breast cancer. So in the next year or two we're probably going to know if they're going to work or not." Boon is optimistic that the odds may shift in favor of the patient. "I believe that if we're able to attack a tumor through two or three or four antigens as opposed to one," he told me, "we are going to do infinitely better. And the good news is that our analysis indicates that there are going to be many antigens we can pursue in every tumor. A way for tumors to escape the immune system is just to stop making an antigen, deleting or inactivating the gene. If we attack five antigens simultaneously, it's going to be very difficult for the tumor to delete all the genes. But besides that, I believe that if the immune system can recognize two or three antigens in a tumor, the primary attack on the tumor by the immune system is going to be enormously facilitated." DEFINITIVE answers about these new vaccines will take years to be reached, in part because the value of a cancer treatment cannot be assessed until the status of patients five years after treatment is known. Oncologists have become so gun-shy about the word "cure" that they resort to the phrase "complete durable remission" to refer to patients who remain cancer-free for five years or more. At least one indisputably complete and durable remission has resulted from the MAGE work. As she sat in a functional black chair in Knuth's office one day, listening to my questions with a wary, almost grave expression on her long face, Frau H. was reluctant even to make eye contact. Frau H. looked nothing like the woman whose tribulations Knuth had spent the previous hour detailing -- an ordeal that included, in addition to metastatic melanoma, open-heart surgery, episodes of psychosis requiring hospitalization, and the death of her husband from lung cancer. Perhaps the most remarkable thing about her was simply how healthy she appeared. Her life had blossomed following her remission, Knuth told me. Yes, she initially returned to the job she hated. But I took it as an almost unquantifiable measure of good health that she lived long enough to quit that job and move on to activities she liked better. Did she know that her cells had been sent to laboratories throughout the world, that important genes had been discovered inside them, that vaccines were being created based on them? She was vaguely aware of this, but mostly because it involved "many, many injections" and the taking of blood. Was there ever a moment when she felt she might not survive? "No, not really," she said with a shrug. "There were moments of distress. But I never felt that it was the end. I never thought it was so dramatic." A fellow scientist has remarked that Thierry Boon is the "quintessential purist," having virtually made a career trying to understand one aspect of biology in a single patient. Boon has never met Frau H. Her recovery has now lasted twelve years; her cancer has not recurred, and she remains a medical anecdote that will never be told in the journals, because her doctors never obtained that conclusive biopsy sample. When I asked Boon if he planned ever to write up her case, he said, "No," wearing on this occasion his coat of modesty. "This is not the kind of thing you write in a paper." The Atlantic Monthly; April 1997; Vaccinating Against Cancer; Volume 279, No. 4; pages 66 - 84.